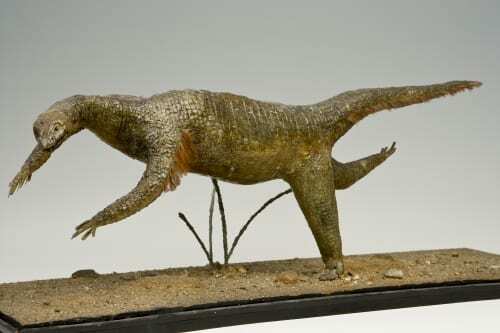 The one about our wax model of Proavis – which isn’t even a real animal! (in 1906 it was proposed as the theoretical link between birds and other dinosaurs). 10. What’s the point of #craptaxidermy? Meet the awful Bosc monitor lizard. 9. The story of our great Whale Weekender. 8. The gross, the bad, and the ugly: a eulogy to the specimens we disposed of. 7. Mary Toft, the woman who gave birth to rabbits by inserting them into herself. 6. The top Underwhelming Fossil Fish story of 2017 was actually the one which purported to be whelming. 5. Why natural history museums are important (as demonstrated by a jar of limpets). 4. The story of The Museum of Ordinary Animals. 3. We built a wall of 4000 mice skeletons from different islands around the world. 2. The story of our experiments with Virtual Reality in the museum. 1. The Proavis wax model Specimen of the Week. Here’s to an equally exciting and diverse 2018. Happy New Year.